This is the road that we have all walked before. Most of us would rather not. We would rather just close our eyes and wake up when the whole awful thing has ended. We would rather open our eyes and see that everything is alright or, even better, back where it used to be. This is grief. We have all experienced it. We have all felt loss and despair; we have all felt as if the very foundations of our world have been ripped away and left us standing to fend for ourselves. We have all felt at times like the abyss in which we find ourselves is consuming us and that there is no way out. And grief is the one thing that does not get easier each time you do it. Each time cuts a little sharper and a little deeper until nothing of our lives make sense in light of the way it was before. This is the road we walk when nothing else makes sense. The road we walk today is no different. Oh, perhaps it seems to be, because intellectually we already know the ending to the story. But it is grief nevertheless. We sit here in this darkened sanctuary contemplating what was done on this day. We can hear the sounds of a world going about its business. That’s always a bit odd for me. There’s a part of me that expects the world, if only for a moment, to stop and grieve my grief, to revere what I revere, and to feel this in the same way that I do. But that does not happen. It is mine to feel and mine through which to walk. If we are feeling this today, can you imagine what the disciples must have been feeling? They were on the ground floor of something wonderful; they were part of changing the world. This radical roving man who they had agreed to follow for life was doing something incredible! What was happening now, though? Was it only five days ago that we came to town? Was it only five days ago that we were at the height of these years—processing into town with all those people cheering us on? Was it just last night that we were eating dinner together? And, now this? What went wrong? Surely this would turn out alright! After all, this man works miracles! But there was to be no miracle this time. Their grief was insurmountable. And, around them the world was continuing on. We as followers of Jesus ourselves have this sense of this execution being a big deal, as if the whole of Jerusalem and surrounding areas shut down for the day to be a part of it. But the truth was, this happened all the time. This was just one more Roman crucifixion in the life of a city that lived in perilous and often tenuous times on the world stage. And, so the life around them did not stop. And they had to face their grief in the midst of it all. And at this point, they had to also look at themselves, uncomfortable as that may have been. What part had I played in this whole sequence? What would I do now? And we 21st century disciples also have to ask where we would be in the story. There was Peter, wallowing in guilt for not standing up for his friend, for denying his own belief. He had wanted so badly to be part of Jesus’ “inner circle”. But why couldn’t he come through when it mattered? There were the fishermen James and John. They had willingly followed Jesus, giving up everything they knew. What would they do now? Jesus was their everything. What about Mary Magdalene? Jesus was the first person that had accepted her, that had loved her simply for who she was? And now that was gone. And Judas…Judas carried the heaviest grief of all. He didn’t know whether or not he could live with himself. The very foundations of their world were gone as they watched their whole world nailed to a cross and slip away. None of this made any sense at all. We Christians have spent centuries trying to make sense of the cross, perhaps even trying to take our own humanity and our own part out of the equation. The truth is that Jesus was put to death because we as humans expected something different. It was humans who took control and did this. But there are more theories of the cross and its atoning power than most of us will ever fathom. It has been described by some as a cosmic battle between good and evil, a battle that God seems to lose at first only to pull it out in the end. Then there is the belief that the cross depicted God’s love in such that we humans might be compelled to follow in faith. And there are those for whom the cross is the satisfaction paid to God for the sins of the world, a substitution of the redeemer for the sinful, implying that God somehow demands a ransom in order to release our redemption and salvation. In all honesty, I struggle with all of these. In fact, none of them by themselves really makes sense to me. It seems, to me that the cosmic battle takes humanity out of the picture, relegating us to bystanders. 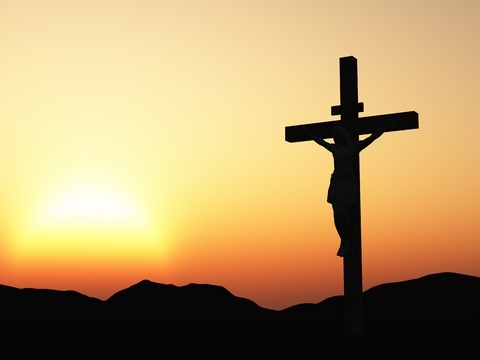 If there is no humanity associated with the cross, what, really is the point? And while the notion of God’s love depicted by the cross is of paramount importance to us, if we leave it there, it sort of turns it into an overly sentimental description of the incredible mystery and power of God. Is that all there is? And, probably the most popular understanding in our history, the understanding of the cross as a satisfaction paid to God for our sins does not really make sense for me. Think about it. God created us in the image of Godself. It would not make sense, then, for God to have to be talked into loving us. True redemption is not a required sacrifice, but an act of overwhelming love by God who desires us as much as we need God. It is we humans that try desperately to come up with a reason for the cross, with a reason for Jesus’ death. Perhaps there was no reason. Perhaps God truly took the senseless, the inhumanness of our humanity, and made sense of it. Truthfully, though, there is no single understanding of the cross that has been accepted by everyone. None of them are mutually exclusive. And none, alone, really make sense of something that is so filled with the pervasive mystery of God. In a way that sometimes makes little sense to us, God turned suffering into joy, betrayal into forgiveness, and death into life. From that standpoint, the cross, for me, could be counted as God’s highest act of Creation in all of time. The cross is God’s overwhelming love made tangible and real and accessible for each of us. God took something so horrific, so senseless, so utterly inhumane, and so personally painful and recreated it. But when you think about, God had done that before. If you remember, in the beginning, there was nothingness, senselessness and God created all that there is, bringing order to the senselessness. And it was very, very good. And now, at the depth of our grief, in the face of what seems to us senseless, God once again creates life. And once again, all of Creation responds. Other Gospel writers depict the Crucifixion by saying that the whole earth shook, rocks were split, graves opened and the temple curtain that had always separated the sacred from the ordinary was torn in two. As the earth opened up, surely seeming to the world that Creation was undoing itself, the holiest of holies spilled into it. In this moment, when all we see are endings, when grief overwhelms us, when our very lives seem to have been swallowed up, God recreates everything. In this moment, the universe has changed. Death is not just avoided or bypassed but is indeed swallowed up by life. In this moment, death itself is defeated. And God looked at it all. It is finished. And it is very, very good. There’s still a lot in this world that doesn’t make sense. September 11, 2001 still clangs loudly in our hearts, with its almost jarring effects of despair and hopelessness, suffering and death, and its intrusive way that it has affected our well-tuned and carefully planned lives. Communities were devastated, lives were shattered, and the pall of an incredible hopelessness still to some extent hangs in our hearts over Ground Zero. Like many other landmarks around it, the Liberty Community Gardens in Battery Park were almost totally destroyed on that day, buried in dust and ashes. What was left was later trampled by the hundreds of workers and then finally destroyed when it was designated as the place where the smashed fire trucks and rescue vehicles would be temporarily discarded. But more than 2,800 miles away, there were some 75,000 people in the city of Seattle who responded to their own shock and sadness of that day by bringing more than a million flowers to the International Fountain in the Seattle Center. By depositing beauty, it was their way of honoring those who had suffered in the devastation. It was there way of creating something new. But we know that we cannot hold life in our hands. And so as the flowers started to decay, echoing their own tales of death and stench and despair, hundreds of volunteers began the painstaking effort of separating the flowers from the paper, plastic, mementos, and wires that were mixed with them and then chopped and mashed the 80 cubic yards of flowers into mulch for composting. If you garden at all, you know that compost is a metaphor for renewal, a natural part of life and death, a reminder of new hope gained from loss. It is a reminder of rebirth and recreation. From the sadness of the twin towers, was birthed a source of life. But the story doesn’t end there. One of the volunteers had an idea. And so, in September of 2002, a year after the desolation of the Battery Park Gardens, thirty-two donated boxes were each filled with forty to fifty pounds of the compost and flown to New York City. And on September 28, 2002, the New York gardens were rededicated—to abundance and beauty, and to a future life recreated from present death. Things will never be back to the way they were before, but God has sown the beginning of something new. But we had to wait to see it in all its fullness. We had always envisioned a Savior that would make the world around us alright again. Instead God in Christ began recreating the world into that which it is supposed to be. That, of course, is hard to grasp as we stand at the foot of the cross watching our Lord writhe in pain and despair. But Jesus Christ came as fully human, with all of the feelings and emotions that we experience. Christ knew what it was like to be human, knew what it was like to feel pain, and knew what it was like to grieve. It is tempting to ask where God was through all this. God was there. God went to the cross first. After the Crucifixion, this defeated little band of disciples had no hope. As you can imagine, they had no expectation of anything else to come. Everything in which they believed, in which they had invested their lives, had died on the cross. It seemed to them that the world had been right and they had been wrong. Joan Chittister says that “the road behind us becomes what frees us for the road ahead.” In this moment, God was already freeing them from grief and recreating joy. And us…there is something in all of us that struggles with the thought of God suffering. We instead imagine a God that stands apart from us, shielded from pain, and prepared to pick up the pieces of our lives when we need it. But God, in God’s infinite wisdom rather recreates our lives from the inside, from the point of our deepest pain and suffering, from the cross, and even we become new Creations whether or not we can see it now. The cross is the rebirth of humanity in all its fullness. In this moment, it is death that dies. It is hard for us to see right now. It is hard to see clearly through the tears of grief. Christ died on a cross in immense suffering and pain. And those who love him grieve a grief such that they have never known. As we sit here in this dark sanctuary and listen to the bells toll, we will once again feel the finality of it all. But Louis L’Amour once wrote that “there will come a time when you believe everything is finished. That will be the beginning.” And just when nothing else makes sense, it is in that moment that your eternity has begun. In the Name of Christ Crucified, in the Name of overwhelming Love.